With Russian science not at its best since the break-up of the USSR, Moscow is now attempting to follow an example from its Soviet past. It plans to co-operate with nations from the Commonwealth of Independent States (CIS) - made up of former Soviet republics - in the areas of nanotechnology and innovation. An organisation with a grand-sounding name, International Innovative Nanotechnology Centre (IINC) of the CIS countries, has been set up in Dubna, just outside Moscow. The place is intended to propel Russian science to the heights it once enjoyed, by turning the fruits of pure research by scientists in the former Soviet states into real-life products. This year, Russia has assumed the rotating presidency of the CIS and declared 2010 a year of science and innovation in the territory uniting eleven of the former Soviet republics. These are: Armenia, Azerbaijan, Belarus, Kazakhstan, Kyrgyzstan, Moldova, Russia, Tajikistan, Turkmenistan, Ukraine and Uzbekistan. But observers note that the CIS has always been a rather symbolic organisation, incapable of delivering any real results, and the establishment of the new centre is "more about appearance than substance". Some call it a "political move" intended to allow Russia to benefit from the best scientific minds of its neighbours. It takes a couple of hours by train to get from Moscow to Dubna, a picturesque city on the banks of the Volga river. 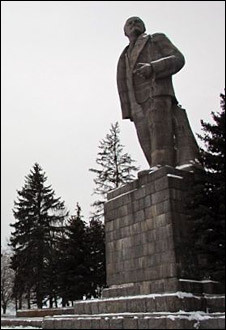 Dubna is famous for the second-biggest Lenin monument still standing, at 25m in height. But it is also known for its scientific institutes. Russians call it "naukograd" - "science city" - which has one of the densest concentrations of scientists from all over the country - and from abroad as well. And it is here, in the pavilions amid the snow-covered woods of Dubna, at the Joint Institute of Nuclear Research (JINR) - an organisation much like Cern (The European Organization for Nuclear Research) where the 117th element of the periodic table was discovered in early April - that the Russian government has created the IINC. This place appeared years after the era of Sputnik, lasers and Nobel laureates, had come to a standstill with the collapse of the Soviet Union in 1991. When the USSR fell, funding for science dwindled resulting in a brain drain as many of the most skilled specialists took up offers from abroad. Here in Dubna, scientists from different CIS states are working side-by-side, regardless of any political differences and conflicts their countries might have. "Yes, there are sometimes jokes about us, but never anything serious, everyone gets along really well. The political problems like gas issues between Russia and Ukraine don't touch us here at all," says Victor Petrenko, a young researcher from Kiev. Mr Petrenko works with special liquids that have magnetic properties. By injecting them into the human brain, it becomes possible to localise and remove cancer cells. It's all done on nano-scale. In October last year, the Russian government announced plans to inject 318bn roubles (US$11bn) into the development and commercialisation of nanotechnologies. The state has already spent some 94bn roubles on this area over the past two years. The money is being used to upgrade old facilities and set up new ones. 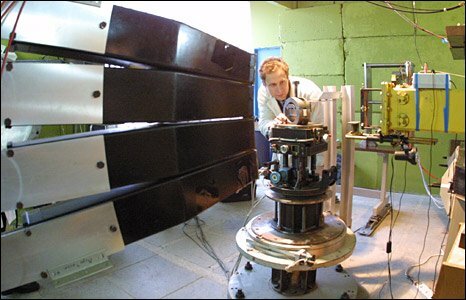 Russia's leading centre for nuclear physics, the Kurchatov Institute - also in Dubna - recently opened a new centre for nano-sciences with an upgraded synchrotron radiation machine. At the JINR, state money was used to repair and upgrade the world's most powerful pulsed neutron reactor. All these efforts are intended to create a domestic nanotech industry by 2015, in order to reduce Russia's dependence on oil and gas exports. Funding organisations like Rusnano give grants to companies with promising proposals, and now Russian officials are even talking about setting up Russia's own version of the US Silicon Valley near Moscow. Although Russia is currently investing in nanotechnology almost as much as the US and Europe, it is still lagging behind in terms of producing real-world products. And this is what the IINC is all about, says the centre's head Alexandre Ruzaev. He explains that the main goal of this institute is the path from concept to final innovation - the commercialisation of scientific achievements of specialists from the former Soviet republics. "There was a political decision by the Russian authorities and the governments of the CIS states to stimulate the integration in the areas of science and innovations. There are similar problems related to innovation in the CIS countries as there are in Russia, but they're even more serious because of limited financial resources there," said Mr Ruzaev. "We decided to use the commercialisation aspect of scientific and technological developments. It lets the CIS states get involved in what's happening in Russia and in Europe and also lets us strengthen our positions in the CIS countries." The researchers at IINC believe that the centre can help improve the state of science in the CIS countries by giving scientists the motivation to work. It's not about the money, they add - the average monthly salary here is equivalent to some $350 excluding grants. In their native countries it is often even less. 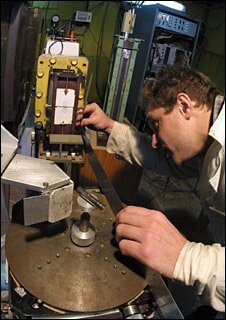 Physicist Andrei Tamonov from Russia thinks that the "true" motivation comes from knowing that people will indeed put the results of your theoretical work into practice. "It is always nice to know that your work won't lie under a thick layer of dust on library shelves, but it will be the basis of some technological development," he explained. His Ukrainian colleague Elena Kazima agrees: "Commercialisation means financial output, which implies the creation of better working conditions. That, in turn, will motivate young people to go into science." "Young people aren't very demanding, you know - they just need at least some decent working conditions. In Ukraine people want to work in science, they have ideas, but they're forced to go elsewhere because there are absolutely no decent working conditions whatsoever." Yuri Khaidukov, a young physicist from Kazakhstan, works with magnetic nanoparticles used to store memory in computers, memory cards and other devices. He says that the creation of the IINC doesn't involve a brain drain from his homeland. On the contrary, he believes that it's a great way to support science there and to help researchers from the former Soviet states make their voices heard. "I wouldn't call it "brain drain"; it's rather a rotation of the work force. I left my country, but I still remember where I was born, I remember all the scientific institutes there -and I still keep in touch with them. Now, thanks to me, there's a special relationship between Dubna and Almaty (in Kazakhstan)," said Yuri. But analyst Valery Khomyakov, the head of the National Strategy Council think tank, says the creation of IINC is a political move as well, meant to enable Russia to harness the best scientific minds in the post-Soviet states. "Of course, it's mostly about strengthening our own scientific potential than helping anyone else. I think that the purpose of setting up this centre is first and foremost to address the areas where we have problems - we lack specialists both in fundamental and applied sciences," said Mr Khomyakov. Masha Lipman, an analyst from the Carnegie Moscow Centre think tank, says that whatever the driving force behind the IINC's creation is, such an organisation won't and can't help Russian science. "We can hardly expect this centre to produce breakthrough innovations or scientific achievements. Just like many CIS structures, I think this is more about appearance than substance," she said. "Russian science is not in great shape these days, this is to say the least, and it would probably benefit from collaboration with more developed countries, not with the countries that are inferior to Russia - economically, in terms of science, in terms of organisation and such like." As for the young scientists from the CIS states, they say they're glad the IINC gives them jobs - and the hope of a brighter future.